Be ready to meet the tradition of the argentine gaucho in this dazzling Gaucho Shows in Buenos Aires. Day trip to estancias in Buenos Aires. Discover the gaucho history, culture and traditions. 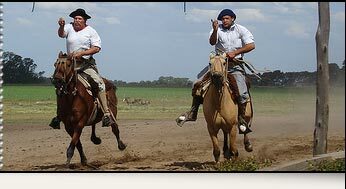 A unique opportunity where you will be able to see more than 10 dancers and horse riders and enjoy during the show, the best argentinean meat. 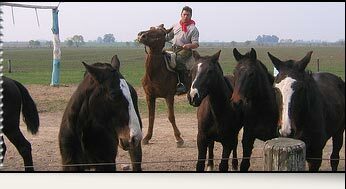 A whole day excursion to Estancia Don Silvano, located in Capilla del Señor just 87 Kms. away from Buenos Aires. Here, you will enjoy horsbackriding and rides on carriages. Also a visit around its museum, native barbecue, a local folklore show, gaucho skill performances, sortija and cuadrera races and a variety of activities offered by this ranch. The gauchos will welcome you with fried meat empanadas (popovers) and baked vegetable empanadas. Also a good wine, mineral water or soda. on every table. Also an important salad bar. Main course: Chorizo Beef, barbecued cow ribs and chicken. Dessert: Ice cream or fruit salad. Drinks included: Wine, soda, mineral water and coffee. City Tour Fiesta Gaucha "Don Silvano"
Mon, Tue, Thu, Fri, Sat & Sun at 09:30 am. “San Telmo Flea Market” is included on Sunday. A whole day excursion. Visit to Estancia Santa Susana, located in Los Cardales a 77 kms away from downtown. This great house in spanish style was constructed at the end of the XIX century and it is sorrounded by 1200 hectars for agricultural cultivation. Here, you will enjoy horsbackriding and rides on carriages. Also a visit around its museum, native barbecue, a local folklore show, gaucho skill performances, sortija and cuadrera races and a variety of activities offered by this ranch. The gauchos will welccome you with fried meat empanadas (popovers) and corn cream empanadas. Also a good wine, mineral water, juice or beer at its old pulpería (old general store). Starter: Pork sausage, blood sausage, mixed salad. Main course: Chorizo Beef, flank, plate, barbecued cow ribs and chicken. Drinks included: Wine, beer, soda, mineral water and coffee. City Tour Fiesta Gaucha "Santa Susana"
Tue to Sun at 09:30 am. Consult availability for other days. Pick up at hotels in downtown. Palermo & other areas please consult.